It’s been a long while from last update but we never forgot RssBook. We gave extra time to accommodate to the new device and iOS. Fix the bug that starred(save for later) mark does not sync correctly when using Feedly account. If you have missing starred articles, enable ‘Resync All Starred Articles’ at the bottom of sync settings. Add side margin option for article view. Add ‘Mark All As Read’ button at the toolbar of the article list. Update the notification for background fetch on iOS 10 later. Deprecated support for iOS 7. Only support iOS 8 later. We can not keep supporting because it’s not possible to test on iOS 7 anymore. To welcome new update and compensate for the limition in free version, we decide to hold discount event. RssBook will be discounted from $4.99 to $2.99, starting today(2015-11-3) until 2015-11-10. Thanks for your continuing support. We have finished the work for next update. This update contains support for iOS 9. But to our regret, we decide to give more limitation on free version. From next version, sync will be limited to max 3 feeds at a time ( from previous 10 feeds). RssBook is not so popular but we want to continue its development. We’re just asking for your generous understanding. The Update will be released in the very near future. We didn’t forget RssBook. 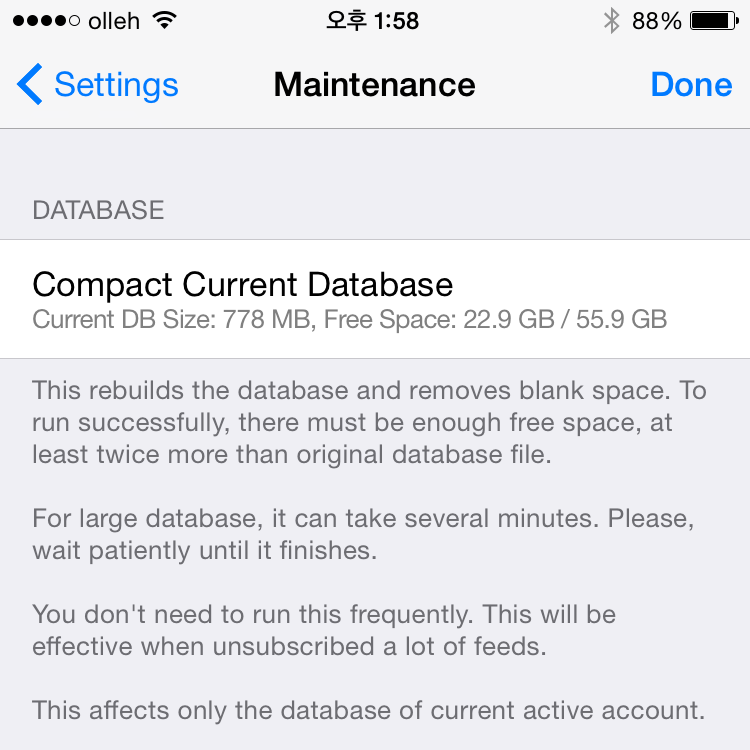 Here is a small but long anticipated feature, ‘Compact database file’. It’s located at Settings->Maintenance. Generally you don’t need to run this, but it will be useful in case, when unsubscribed a lot of feeds, or have been using this app massively for a long time. Internally, this uses ‘VACUUM’ command of sqlite database, which rebuilds the entire database, deletes blank space and organizes fragmented pages. Warning: You can not cancel this action. You must wait patiently until it finishes. If app is terminated while compacting, you will be forced to wait until completion at next app launching. In our test it completes quickly at the devices such as iPhone 6 or iPad Air 2, but older devices than that it can take a lot more time up to several minutes depending on database size. This is a major update for iPhone 6 / 6 Plus, iOS 8 and background sync. Searched Folder. Searched words come into main sliding navigation. Sliding UI for iPhone. Finally sliding UI is applied to iPhone. It takes full advantage of various screen size of iPhone 6 / 6 Plus. From this version, free version has following limitations: Sync will be limited to max 10 feeds at a time.